These 2 concepts, which were incorporated in the group's companies, have profound implications for the design of products and for the associated risk analyses. Design must take the environment in which the medical device will be used into account (hospital, HEPAD, home, etc.) and reduce as much as possible the risks incurred from incorrect handling. A good knowledge of the MD and its ergonomics by users (biomedical engineers, carers, patients, etc.) is therefore essential - in addition to design - for optimum risk management. Winncare Services offers a complete range of training in the group's various products to take the requirements of the new Directive into account. Several training levels and educational aids have been developed to satisfy user requirements. Do you need training for one or more of your representatives? Would you like a customised training programme suited to your structure and your requirements? Would you like this training to take place at your premises to make the best use of your representatives’ time and to reduce costs? The advantage of inter-company training is that it offers an ideal opportunity to share experience with trainees from other perspectives who work in similar areas and have the same issues. It is very interesting if you only have 2 or 3 people to train. All catalogue training can be conducted at your premises to reduce non-productive time of your representatives. Our aim is to provide an appropriate response to your expectations. 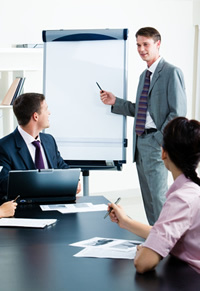 We are therefore able to provide training solutions that meet your requirements. After an initial diagnosis to understand your needs, Winncare Services will assess your requirements and offer you something which is suited to your context and your restrictions. A personalised and detailed quote will be given to you to help you in making your decision.